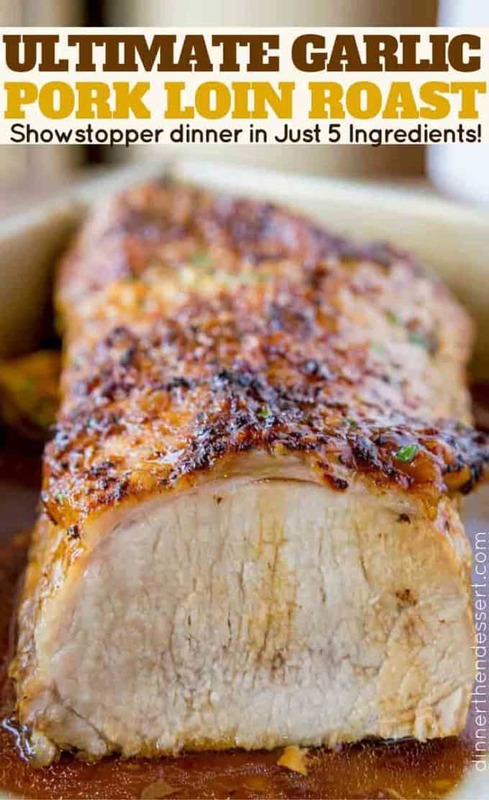 Ultimate Garlic Pork Loin Roast made with just five ingredients, it is easy enough for a weeknight meal and fancy enough for your holiday dinner parties! Want to make a dish that looks hard but is actually incredibly easy? A show stopping but EASY Garlic Pork Loin Roast is the way to go and you’ll love the savings over the more expensive Perfect Garlic Prime Rib you may have been planning on making for your family holiday dinners. 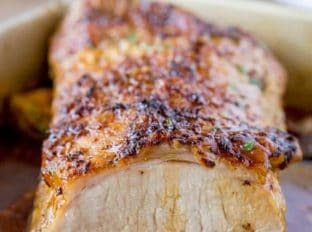 Garlic Pork Loin Roast sounds like it would be a hard dish to make, but it actually takes almost no time at all. Part of the magic of this dish is the cut of the meat we are using. 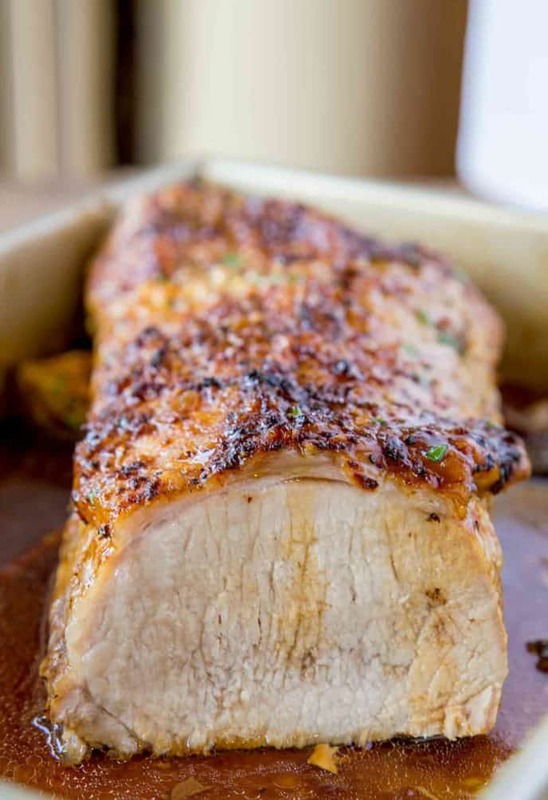 A pork loin (very different from the tenderloin) is a great cut of meat that comes with its own built in baster because of a thin fat cap it has along the top of the cut of meat. 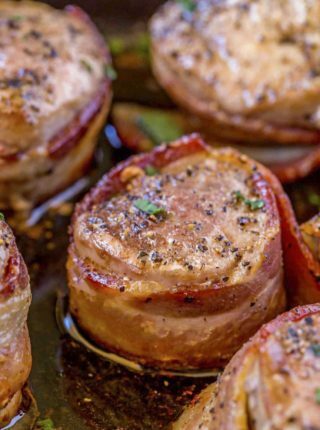 By seasoning aggressively and using this fat cap we can make a really flavorful and delicious meal that has a crispy seasoned top and is super tender and flavorful. You can certainly also make the Pork Loin Roast in the slow cooker, I have done it twice! 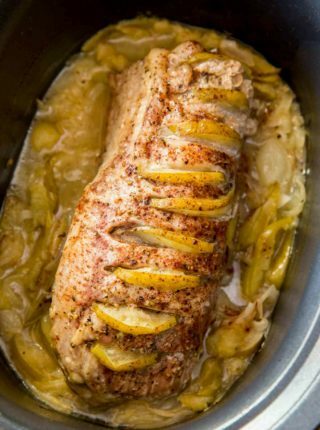 Once I wrapped it in bacon and made a Slow Cooker Bacon Garlic Pork Loin and the second time was just last week when I make Slow Cooker Honey Apple Pork Loin where I stuffed the pork with sliced apples. Both options are great, and easy as well. Make sure you are cooking it with the white fat cap side up. To have seasonings adhere even more you can score the top with your knife in an x pattern. You don’t have to cut very deeply, just enough to create grooves the seasonings can sit in. You can add vegetables or apples onto the sides, but beware this will increase cooking time as it will keep some of the heat from cooking the pork. 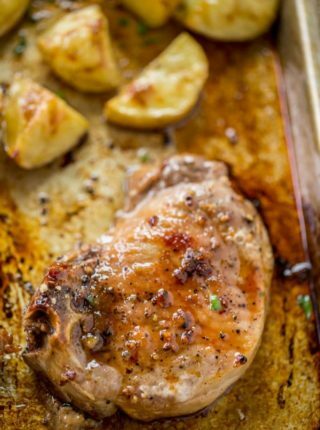 A quick and easy side side instead of serving applesauce with your pork would be adding apples. I added 3 quartered Granny Smith apples and let it roast along side the pork. What is a safe temperature to cook pork to? The National Pork Board recommends cooking to an internal temperature between 145 and 160 degrees. This is a perfectly safe temperature to cook to even though it used to be higher in the past. Since we are cooking a roast here and it will continue to cook through once outside the oven, we will stick to 150 degrees doneness and let it rest for 5-10 minutes before serving. 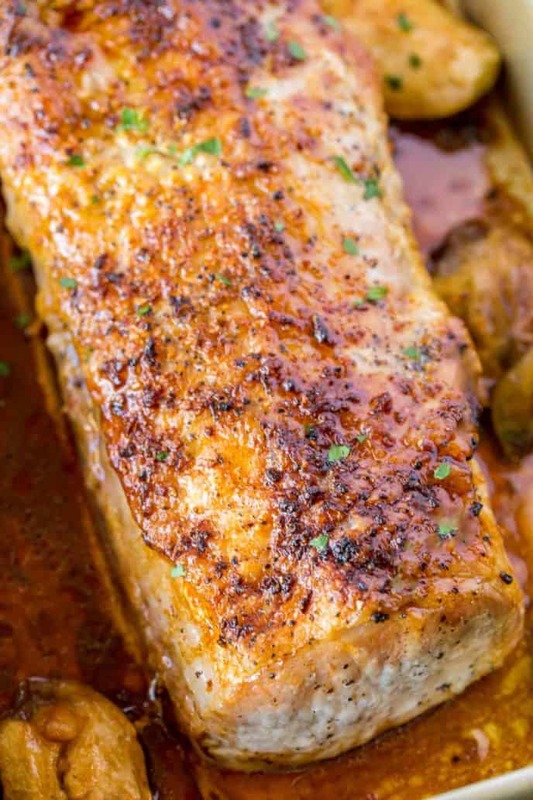 To cook a pork loin (which is different and larger than a tenderloin) safely, you should cook it for roughly 25 minutes per pound of the loin you are cooking assuming the roast is 3-4 pounds. If you are cooking and entire loin (8-10 pounds) this figure changes completely. For a full pork loin reduce heat to 350 degrees and cook for about 10 minutes per pound. 9×13 pan: Keeps the liquids the pork releases from ending up on the bottom of the oven and browns great. Oven Thermometer: Easy to test if your pork is done and safe to eat without opening the oven to check and slow down the cooking. 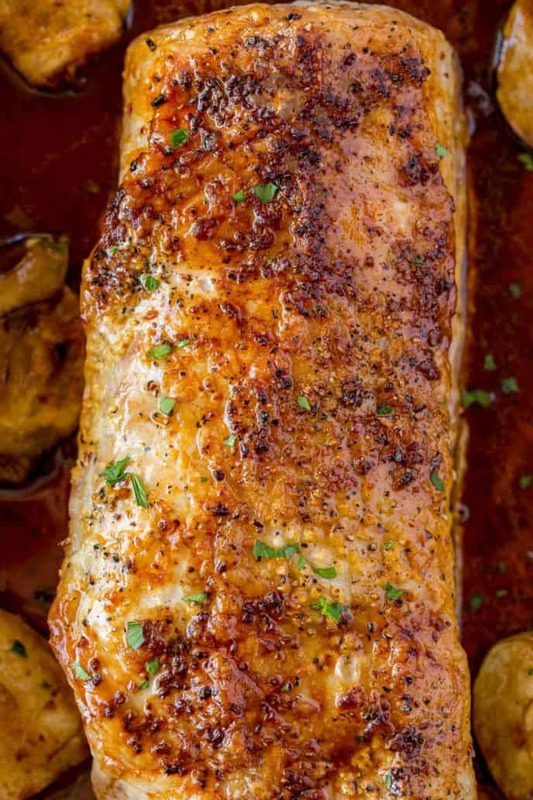 Add the pork loin to your baking pan. Coat with the garlic on top of the fat cap. Mix the seasonings (salt, pepper and paprika) in small bowl and rub it on the pork. Cook the pork for 60-75 minutes or until it has reached a temperature of 150-160 degrees. Remove from the oven and let rest for five minutes before serving. I am making this for Easter dinner. I need to double the recipe. How long should I leave the roast in the oven and at what temp? I am really looking forward to making it! Thank you! If your pork loin is around 6 pounds (double the recipe), you’ll want to cook it at 350 degress for 10 min/lb (1 hour). Make sure to use a meat thermometer to check for doneness as ovens may vary. Hope this helps! Did you wrap it in foil or just cook without it? You’ll want to have it uncovered. I have a 4.75 lb loin, do I use the cooking time/temperature for the 3 to 4 lb roast or the 8 lb roast? You’ll want to set the oven for 350 degrees and cook it for 20 min per pound. Make sure to use a meat thermometer to check for doneness. Enjoy! I made this with a 2 lb pork loin without a fat cap. Scored the top a little and followed the directions. I added around a pound of chopped vegetables (broccoli, carrots, onions, and a potato) in the 9×13 metal pan. I cooked it for 1:10 because of the vegetables and altitude (8100?). Temp came out between 160-165 degrees. An hour probably would have been about right. Rested for 10 minutes and was juicy when I cut it, but a little tough. I give the recipe 4 stars assuming it would have been a little better if I had cooked it less; my version gets 3. I’m sorry but I’ve never tested it using one so I’m not comfortable giving a recommendation. If you decide to try, I’d love to know how it turns out. Thanks! My mistake… I misread.. Sorry and thanks for the recipe.. I’m just wondering if I cover the roast…??. No worries 🙂 You’ll want to leave it uncovered. This was so good! Very flavorful and very simple. I’m so glad I found this recipe. Hi. Won’t the minced garlic fall off once we turn the roast to season it? Should we rub the season in first then add garlic lastly? I just left the pork loin sitting flat when I rubbed on the seasoning but you can do it in whatever order you’d like. 🙂 I hope you enjoy it! This was stupid easy and crazy delicious! Thank you so much! Do you place the fat cap face down or up while cooking? This recipe looks delicious! My pork loin roast is only 2.5lbs. Should I cook it at 375 degrees for 25 minutes per lb or lower time and temperature? It might only take 20-25 minutes per pound at 375. Make sure to use a meat thermometer to check for doneness. Holy Moly! My family loved this! My meat wasn’t still frozen but it wasn’t all the way thawed either. I cooked for an hour and then covered it with foil for another 20 minutes in the oven. Let it rest and poured the remaining juices over it before serving. This was so easy and your tips were super helpful. Thank you! In my oven right now. Cant wait! This was awesome and easy. Thanks. I will make it again soon! If you add potatoes and carrots should you put foil on it. And how much longer would it takes. It may take around 2 1/2 hours for a pork loin this size with added vegetables. Enjoy! Do you roast with lid on or off? I made this tonight in my cast iron skillet and it was delicious! I did add a little olive oil to the rub along with some dried rosemary. I made a pan sauce out of the drippings with some dry white wine, Worcestershire sauce and butter. Absolutely scrumptious! Thank you so much for sharing this recipe! I made this recipe tonight and my husband couldn’t stop raving about it. I followed the recipe exactly as is. Thank you for sharing it. Yay!! So happy he loved it, Cindy! Husband said I outdid myself with this one. Excellent flavor and juicey. 10 minutes before done I added a little chicken broth to the pan. When done put olive oil on top and broiled for a few minutes. Thanks for the recipe. Will be making again!! Thank you Sabrina. This is the best and easiest roast pork recipe I have ever tried. My pork loin roast is 4 1/2 pounds. Should I reduce temperature to 350 degrees and approximately long should it be cooked. I would cook it at 375 degrees for 25 min per pound. Hope this helps! This recipe was delicious! Don’t know why with such simple ingredients but it was so good! I didn’t have minced garlic so I used garlic powder, sprinkled that and the other spices in all sides of the roast, it’s a keeper! Very good recipe thanks for sharing, even though I messed up and used Smoked Paprika and maybe to much salt, it was very tender and delicious cooking to 150 degrees . I just made this recipe today and my husband loved it as did I! So moist and the natural juices that made the perfect jus was perfect! I will definitely be making this again and again! So glad you guys enjoyed it, Linda! Thanks for the 5 star rating. This is my first time making this pork recipe. Can you give me a few idea’s of what sides I could serve with the roast. So anxious to try this tomorrow evening. Have a very small ( 1.87 pounds ) pork loin. Had a large loin cut in 1/3 because just 2 of us. Since I almost NEVER roast anything without using a thermometer, not sure how short/long time it will take but plan on removing from oven at 140 degrees and eat when reaches 145 while resting. Can’t wait !! The bake time is way too long. You only need to bring it up to 139° and then let it rest for 10-15 minutes. Pork doesn’t need to be well done-loin is particularly lean and will be very dried out at 150° or above. Turn the oven down to 275° and bake a 3 pound roast for about 45-60 mins. You will be pleasantly surprised how much more tender and juicy it is. Always use a meat thermometer to verify as oven temps may vary. I have a 2 lb boneless pork loin and just took it out of the freezer and put it in the fridge. Should I change the temperature or cooking time if it is not thawed all the way through by tomorrow afternoon? Your question got caught in my spam filter, so sorry. I know you’ve already cooked it so I’m hoping it turned out for you. If this happens next time you may need to increase the cook time by 25% but check it since it’s partially frozen and it’s hard to determine how much additional time is actually needed. 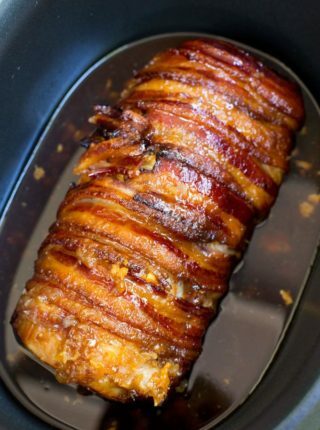 I just made this recipe – ultimate garlic pork loin roast. It is so delicious! Tender and juicy and just perfect. I had to make myself stop sampling it so my husband and grandson will have some for supper. Boy, did I hit it lucky when I found this site! I haven’t tested it using an instant pot so I’m not really comfortable giving a recommendation. 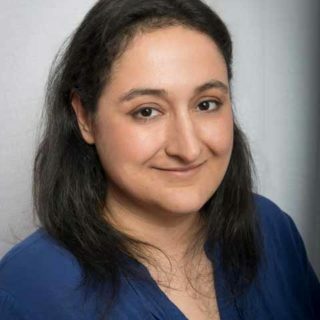 You might be able to find a recipe online with similar ingredients using one and follow that as a guideline. Sorry I couldn’t help more. I am making this tonight and I can’t wait! Just curious.. My husband bought me an 18 quart electric roaster and it came with a rack with handles that you just set in the roaster and it makes it easier to get the meat out. My question is, should I just set the pork loin directly on the rack, or cover the rack in foil first? This is my first time using this roaster and I’m a nervous wreck and don’t want to screw it up! Haha. Thanks for the recipe and for any tips you can throw my way will be much appreciated! ? I’m so sorry but your question got caught in my spam filter. I hope it all worked out ok for you. You can use foil in your roaster to help with clean up but it’s not necessary. I made a small 4 pound pork loin yesterday. cooked it at 325 degrees till my thermometer which is accurate registered 150 degrees – let it rest 15 minutes and it was like tough shoe leather – I threw it out. This is the way I have always cooked pork roast but lately it always comes out really bad and I don’t know why??? Has meat changed that much? It was lovely piece of meat with a nice layer of fat – so disappointed……. Oh no! That’s so weird that it keeps happening. My smaller pork loins I cook at 375 for roughly 25 minutes per pound. Hope this helps. Made this tonight for our New Years Day dinner, and it was amazing! Served with mango salsa, patrician “cauliflower” potatoes and steamed broccoli. This will be our go to recipe for pork roast. Thanks for the recipe and Happy New Year! So wonderful to hear, Amber! Happy new year!! This recipe is not only simple but delicious! Today will be my third time making it. So this is my first attempt at a roast…. I have 7.07 lb roast… will I cook at 350 or 375? I made this recipe today for New Year’s Day. It was absolutely succulent. It was juicy, mouth watering, and had the exact right amount of spices. I actually use some fresh Rosemary, some Rosemary & garlic, from Sam’s, and some mustard, I mixed all that into a paste. Then I basted it it with a paste and olive oil. It is also very important that you baste the roast periodically. I cooked it for about an hour which was just the right temperature. I would definitely make this roast again..!!! I also used to bat a tablespoon of minced garlic. You completely changed the recipe! How vey annoying to highjack this recipe and rate YOUR recipe!